I'm sure that many of you are quite familiar with mangoes and so this post will be mostly comedy. I say that in light of my recent incorrect assumption that I could figure out how to properly cut open a mango. I'll spare you the gory details but lets just say that I ended up with sticky mango juice on the counter, the floor, my shirt and the dog. My foray into tropical fruit began when Brian and I recently celebrated our anniversary at a stunning waterfront restaurant called Harvest-on-Hudson. Despite a few debacles, we were treated to a couple of new cocktails including a mango creation that I managed to chug in record speed and promptly order another. That's not like me but it was quite lip-smackingly delicious. Enough so that I wanted to recreate it at home. Up until then, mangoes were these mysterious oval shaped things in a box on the side of the fruit vendor's cart. I didn't know anything about them so I happily ignored them while scooping up my usual favorites. But now I needed to address this issue with the fruit cart man. I asked him to help me choose a couple of ripe specimens and headed back to my kitchen. An hour later, as I was cleaning mango goop off the dog, I thought it might be wise to consult the internet on the subject. Mango goop. Don't let this happen to you. After watching an excellent YouTube video on the subject and a return visit to the fruit cart man, I was back in my kitchen and now able to dispatch a mango in a semi-professional manner. (Translation: this time I managed not to get any on the dog.) I spent the afternoon experimenting and came up with a recipe that, although slightly different than what I enjoyed at the restaurant, is still lip-smackingly delicious. Cheers! To make the mango puree, place peeled and cut mango pieces (see below) into a blender or small food processor with approximately 3 tablespoons of water per mango. Blend until completely pureed. Add 3 oz. of the puree to a cocktail shaker along with the mint and muddle together using a muddler or the back of a wooden spoon. Add the vodka, rum, lemon juice and simple syrup to the shaker and fill with ice. Shake well and pour into a chilled cocktail glass. 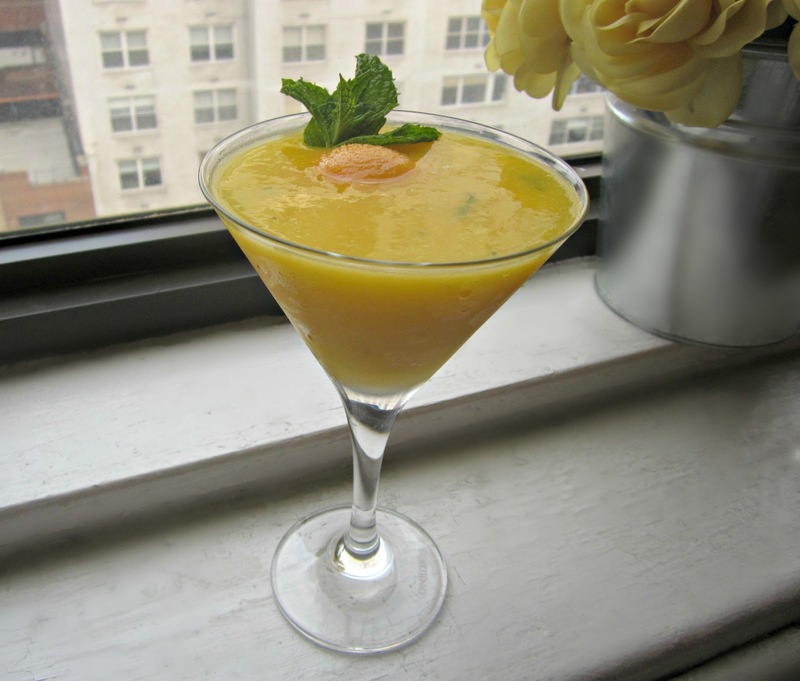 Top with a scoop of mango sorbet and garnish with a sprig of mint. Click here to see the YouTube tutorial on how to cut a mango. I just had a mango martini at dinner with my girlfriends last week!! This looks yummylicious and mangoes are just heavenly!! Mango is one of my favorite fruits, the martini just looks so refreshing,delicious drinks !! 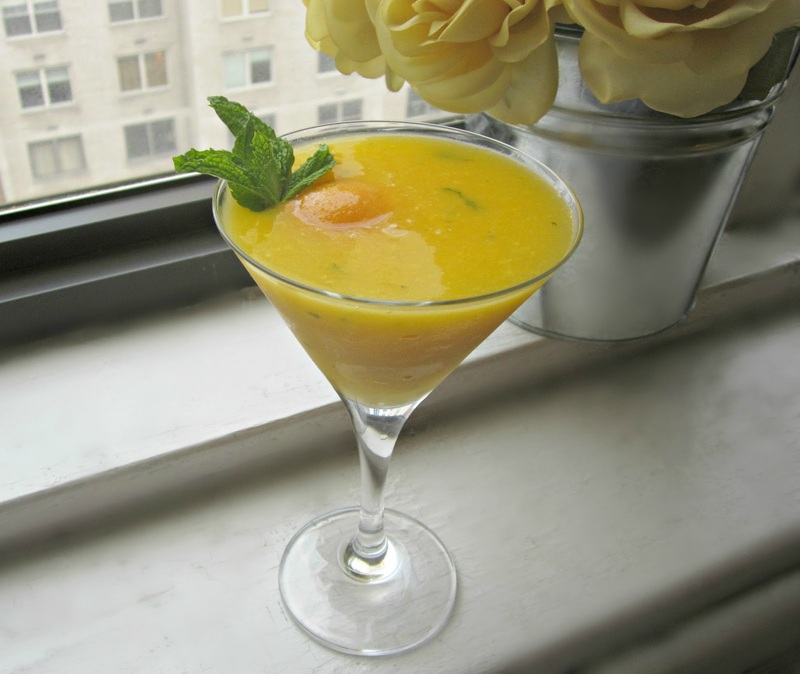 Mango has a wondrously strong-sweet flavor - I'll bet it makes for a dangerously delicious cocktail such as this. Well done! Mangoooooooooo with boooooooze. Why do we not live closer together? Really. I wouldn't have had a clue how to cut one had I not learned in a cooking class. I hope your fingers survived the experience. What a pretty drink! Too funny...glad the dog was spared the second time around! This cocktail shouts summer...mmmmmmmm. 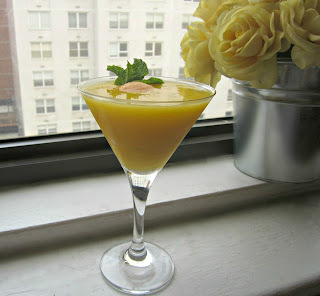 Love your pic of the mango goop; too funny! Why are mangoes so hard to get in to?? But the mess is worth it. So tasty! This sounds fabulous! I love anything mango. What a refreshing drink! I'm living vicariously through you and your amazing alcoholic drinks this summer, although this would be pretty easy to do virgin too I suppose! I have never had good luck cutting mangos and often even avoid the things because of the whole debacle! Glad you were able to have a better second go at it to make this delicious concoction! This martini looks amazing. It's such a pretty color. Let me just tell you, I am horrible at cutting a mango. It's awkward and slimy and so hard to get pitted. Honestly, they're lucky they're delicious or I wouldn't waste my time on them. Thanks for sharing this delicious drink. This is so pretty and it looks absolutely delish! I love mangoes! Wow Anita! The martini looks amazing! So refreshing and delicious! I love your booze posts. ;.) Looks refreshing! Happy belated anniversary! This martini looks perfect for a treat on the 4th!